It seems like I’m one of the last to share my reactions on C4C each year. It’s difficult to say more than I have said in the past, and yet, each year I am thrilled at the prospect of contributing to the excitement and joy of children at Christmas. Even my own kids eagerly helped me select some sets this year to give to the donations. This year in Grand Rapids, we were able to work with Billy Bear Hug Foundation again and are grateful continuebuilding and strengthening that relationship. They reach so many families in need of kindness during the holidays. With the help of BBH and their student volunteers, we were able to reach _____ kids and shine a light. C4C continues to be a highlight in my year as an AFOL. So much thanks to all who contributed time, energy, and more to this year’s fundraiser. Its a privilege and an honor to help such a great cause. This was our first year buying and distributing for C4C and it touched our hearts. We supported the cause by donating 10% of our November earnings to the cause and we thank all those who shopped at eclipsegrafx.com to help us raise more money. When ever we do any charity work we like to involve our kids in the process so they can see for themselves that they are blessed and that they can use those blessings to help others. For our first time around we decided to help 2 groups of children. One from the “Rainbow House” group home in Jonesboro, GA. The group home fosters children from the age of 13-17 and they had about 20 kids living there at the time. We also helped an organization, Operation LunchBox, that donates food to children in poverty and homeless children in the Henry County area of GA. They feed over 1500 kids a week and have plans on expanding. In order to keep the children’s identities safe we wont be able to photograph them enjoying their new presents. Walking into Operation Lunch box. My children enjoying picking out the perfect presents for the children in need. At the end of the night my daughter was crying because she wishes we could do more for these children. We have come up with a better plan to help even more children next year and we hope to multiply our reach. Thank you C4C for all you do and thanks to everyone who supported the drive. All the sets were sold, there were just no more. From the C4C store, so many Sold Lots! These Donated builds, were converted to gifts. These LEGO sets, Kid’s sprits they lift. AFOLs MOCs to Presents tucked under the Tree. Thanks everyone for your help in this deed. To give a little back, to children in need. I’m privileged to be able to help with Creations for Charity again this year and take the money raised from the awesome donners and buyers and procure some awesome LEGO sets for some children in Toronto, Canada. Again we chose the Toronto Children’s Aid, which is the our equivalent of Child Protective Services as well as provide support and services to children and their families. With the usual help of our ToroLUG Elf: Eric, and some ToroLUG donations – we managed to donate 67 sets or about $2100 in LEGO. LEGO is the most requested item from parents and is an infrequent donation, so a large LEGO donation is cherished and always in need. So the Children Aid’s Society is always extremely happy to get our yearly donation. I’m not sure how to keep saying this: but it’s an incredible feat to see how this community can come together and do something great to help others. From the bottom of my heart, Thank You. Happy Holidays! Once again, thanks to your donations and support, the Dallas, TX area contribution of just about $2,000 RRP of LEGO sets was given to stock Chosen Ones’ gift closet! Chosen Ones is a nonprofit 501(c)3 organization that helps children in foster care, children who are eligible for adoption, and families who are caring for them get support. Over 4,100 children in the Dallas-Fort Worth area are in foster care after having been removed from their parents (either temporarily or permanently) by the State due to abuse or neglect. Chosen Ones provides support groups, resources, and tangible assistance through a “Just 4 U Closet” available for foster and adopt families to use as a resource anytime they need to. 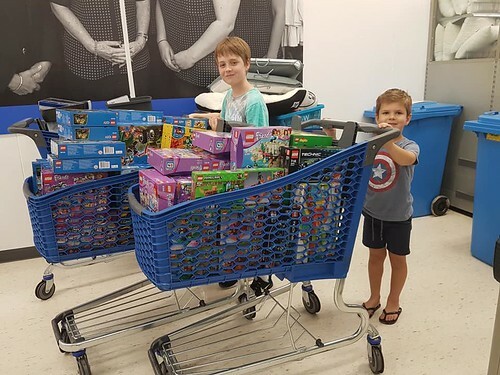 In addition to stocking children’s clothes of various sizes and other toys, they are now fully stocked with LEGO sets for these children who are in very emotionally (and sometimes physically) trying situations to have and enjoy, giving them something to build, feel proud of, and use their imaginations with. A huge thank you once again to everyone who contributed to make this happen. Your donations are making a difference and will continue making a difference in the lives of these special children for years to come! This year we donated Lego sets to about 75 refugee children living in Cairo, Egypt. We made the donation at the African Hope Learning Centre (AHLC), which provides a safe education for children of refugees who fled the war in South Sudan and other conflict zones in Africa. Due to overcrowding and prejudice in local schools, AHLC provides refugee children a needed alternate learning center. Before donating individual sets to the children we played with them from tubs of Legos during their art classes. It was a very enjoyable experience to see them make their own Lego creations. Enjoy the photos. First I would like to say thank you to LEGO fans who donated or purchased and took part in this project. Without you, this wouldn’t be possible for us to participated for the fifth time in row! This year again my plan was sending the LEGO sets to children who are really in need and extreme poverty. Orphanages and institutes near the border usually have less money to buy or purchase presents for the children in Christmas time so I decided to transfer the biggest part of LEGO sets there. We also gave some sets to families who lives in the poorest countryside, and maybe never would be able to give any presents to their children. 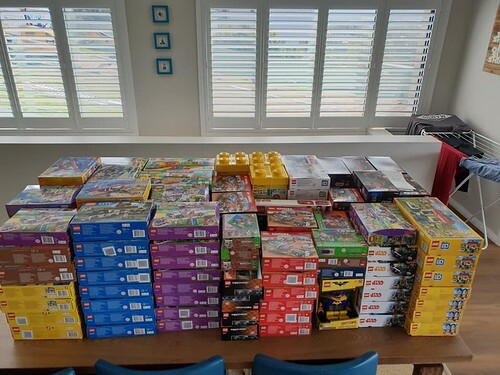 All in all we donated over $1,300 worth of sets which is more than 60 LEGO sets… And the kids laughter was uncountable! Children who are living in orphanages or children’s home usually get used toys for present. At this Christmas time, maybe at first, they spent hours playing with high quality brand new LEGO sets and their heart could fill with plenty of joy. I hope we managed to give some special experience to lot of hungarian children who may didn’t have this much happiness in their life so far. It is a pleasure to experience how much help can we get from the community based on LEGO! A huge thank you once again to everyone who contributed to make this happen. Your donations are making a difference and will continue making a difference for years to come! I wish amazing holidays to all of you! 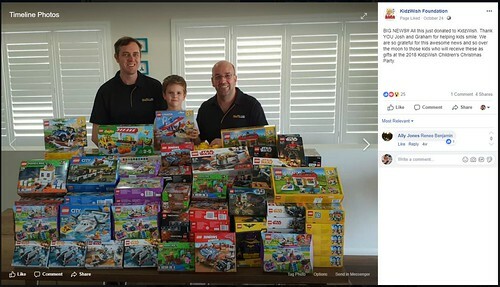 Posted in Uncategorized on 09.12.18 by Josh M.
Once again a huge thanks to Nannan, the Creations for Charity team and the greater AFOL community for giving me and others the opportunity around the world to help out disadvantaged kids to a LEGO Christmas! Graham and I hit the stores and bought up big! 240 LEGO sets from themes like Friends, City, Star Wars, Ninjago and more! This was one of our trips to the shops! The Kidzwish team were once again amazed by the number of sets we were able to donate. 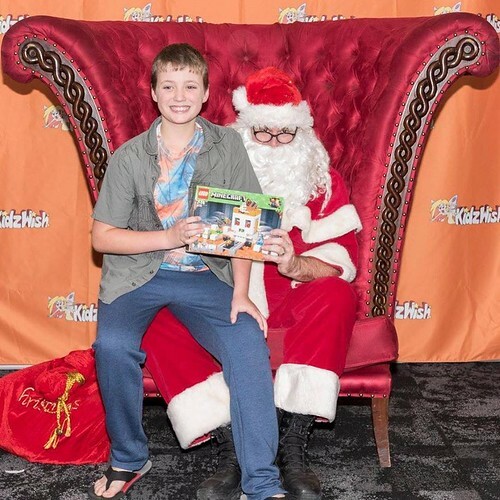 The Christmas party was another massive success, here are some shots of some happy kids with their choices. 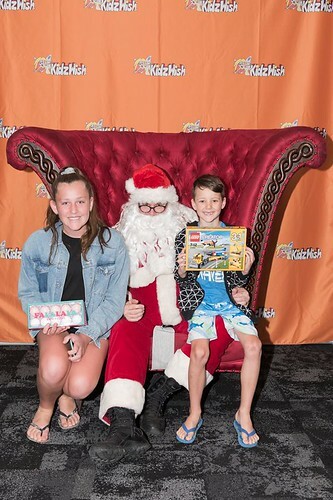 Yet again it was an amazing effort, and we are so glad up to 240 kids could go home with the Christmas gift of LEGO putting a smile on their face. Thanks Nannan and team for 2018! Together we raised over $16,000 this year from Creations for Charity! A huge thanks to all the donors and buyers for this phenomenal result. Please check back by Christmas to see our donation stories and photos. In the meantime, here are all the items that were sold. Just 5 days left in this year’s fundraiser and prices are reduced substantially. There’s still some great creations left!